Each speaker cabinet houses two drivers set at precise angles so you experience consistent stereo effects as you move around outdoors. And the unique multi-chambered design of the Bose 251 exterior speaker cabinet minimizes audible distortion from low frequencies, for sound with clear, natural impact. NEW SEALED!! 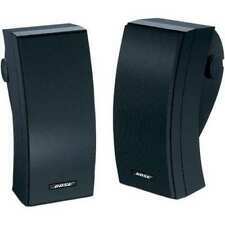 Bose 251 Environmental Speakers - Black. Condition is New. Shipped with USPS Parcel Select Ground. A combination of advanced technology, extensive research and rigorous testing, Bose® 251® speakers set a new standard for performance and reliability outdoors. An Articulated Array® speaker design reproduces sound over a larger listening area. COLOR: WHITE. NEVER USED. THIS BOX WAS ONLY OPENED FOR PHOTOGRAPHIC PURPOSES. I am human. I try my best to be as clear and honest as possible. The Bose® 251B 251® Environmental Speakers deliver performance and reliability most conventional outdoor speakers and many indoor speakers simply cannot match. A patented multi-chamber enclosure helps deliver deep, rich lower notes without audible distortion. 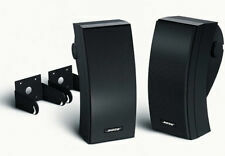 An innovative Articulated Array speaker design distributes sound over a larger listening area. Engineered to withstand snow, rain, salt, and temperature extremes of 158F (70C) to -40F (-40C). Weather-resistant mounting brackets and hardware included to allow for easy installation. Backed by a 5-year transferable warranty. Compatible with amplifiers and receivers rated from 10 to 200 watts per channel. We are an authorized Bose dealer. 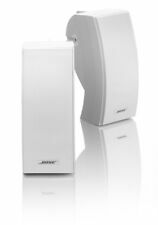 The Bose® 251W 251® Environmental Speakers deliver performance and reliability most conventional outdoor speakers and many indoor speakers simply cannot match. A patented multi-chamber enclosure helps deliver deep, rich lower notes without audible distortion. An innovative Articulated Array speaker design distributes sound over a larger listening area. Engineered to withstand snow, rain, salt, and temperature extremes of 158F (70C) to -40F (-40C). Weather-resistant mounting brackets and hardware included to allow for easy installation. Backed by a 5-year transferable warranty. Compatible with amplifiers and receivers rated from 10 to 200 watts per channel. Model:'24643. Features: multi-chamber bass enclosure for low frequency energy; withstands temperatures from -22 to 140; snow and rain resistant; speakers mount on your exterior walls; connect easily to stereo components or Lifestyle system; and a more compact stylish design. A combination of advanced technology, extensive research and rigorous testing, Bose 251 speakers set a new standard for performance and reliability outdoors. An Articulated Array speaker design reproduces sound over a larger listening area. New Old Stock Bose 251 Environmental Outdoor Speaker Bass Driver. Speaker has a small indention on the rolled edge. Does not seem to have any effect on the sound quality. Priced reduced because of this matter. Condition is New Old Stock. ( Location Box A) Shipped with USPS Parcel Select Ground. Bose 251 Environmental Outdoor Speaker Bass Driver ONLY TESTED. In good condition. see pictures. Overall, it is in good used condition (in my opinion). Both speakers working and sound amazing. All connections are original in the back and all working great. Missing box and manual. ALL PICK UP WILL BE DONE IN PUBLIC PLACE. We are located in the CORAL SPRINGS/COCONUT CREEK/MARGATE AREA. Bose - 251BRKTWH. learn more. - Abt is anAuthorized Dealer. Bose - 251BRKTBK. learn more. - Abt is anAuthorized Dealer.